Samantha Logic dribbles down court for the Young Angels in Kosice, Slovakia, this season. 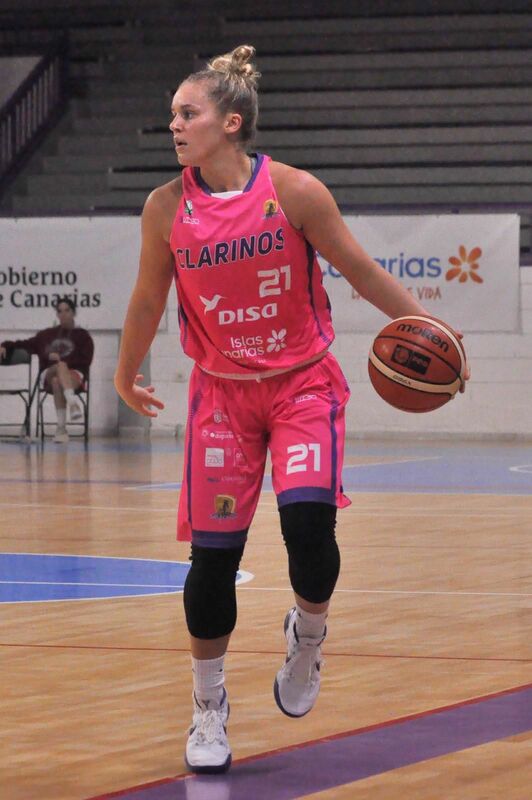 The 2011 Case graduate will play for the Wisconsin Glo in Oshkosh this summer with former Prairie All-State guard Gabbi Ortiz. Gabbi Ortiz surveys the court while playing for Ciudad de la Adelantos in Tenerife, Canary Islands in Spain this season. The four-time All-State guard for Prairie will be joining Case graduate Samantha Logic on the Wisconsin Glo of the Global Women's Basketball Association this summer. Samantha Logic and Gabbi Ortiz, whose respective high school basketball careers in Racine County barely overlapped, have long had a deep respect from afar for each other’s skills. Within a matter of weeks, they’ll be teammates. Logic, the AP Player of the Year in Wisconsin as a senior at Case in 2011, and Ortiz, a four-time All-State player for Prairie, will be teammates on the Wisconsin Glo, a new organization in the five-team Global Women’s Basketball Association. Other teams in the league are based in St. Louis, Flint, Mich., Topeka, Kan., and Nashville, Tenn.
Logic and Ortiz are finishing their respective seasons and both have flights scheduled to Wisconsin April 30. Logic has been playing for the Young Angels in Kosich, Slovakia and Ortiz for Cuidad de la Adelantados in Tenerife, Canary Islands in Spain. They will be joined on the Glo by players mostly with Wisconsin connections. The Glo, who open their season May 10 which an exhibition game, will play its home games at Menomonee Nation Arena in Oshkosh. “I think this is a great opportunity to be able to showcase the talent that has come out of our state,” said Logic, a third-team AP All-American as a senior at Iowa in 2015. “It’ll be real cool for kids to be able to come and watch us do this as a job. Ortiz, whose team went 22-4 and finished second in its league, will play in the finals April 25-28 before heading home. Then she will join forces with Logic on the Glo for her summer job. “I think it’s awesome that I will get the opportunity to play alongside her this summer,” said Ortiz, a four-year starter at Oklahoma from 2014-18 who turned 23 Monday. “She is an extremely talented player who’s had a career I look up to. Logic was a senior at Case when Ortiz was a freshman at Prairie during the 2010-11 school year. The two have only played some pick-up games against each other, but Logic has liked a lot of what she’s seen from Ortiz. “I know how much she loves to play and you can easily tell that with that edge, that chip on her shoulder, and I love playing with people like that,” Logic said. “We’ve played pick-up when we’ve been back home a couple of times and her range can open up the paint for us. She searches for open spaces to get herself in a position for a good look. In an interview with Jason Zimmerman of WBAY in Oshkosh in February, Fox Valley Pro Basketball president Greg Pierce expressed high hopes for the league. Logic is hoping this is the start of something big.